A true resort experience! Fabulous amenities, incredible view of the harbor, and location convenient to dining, shopping, and other points of interest. Will definitely stay again, only longer! The check in folks had some challenges but we understood and got our room. Lovely stay. Loved this resort- beautiful and comfortable. The only issues we had were: 1) housekeeping did not clean our room until late afternoon our first full day there. When they did show up, we were not able to get ready & had to miss our dinner reservations downtown. We asked for early housekeeping for the rest of the visit, which worked out well 2) we ate at the Fish House restaurant twice (see above reason for why we visited the second time- in our pool attire.) The food was ok. So many fabulous restaurants in Charleston and this food does not compare. The waitstaff likes to congregate in the kitchen hallway & chat. The first visit, there was a dirty table 2 down from us- it was a slow Thursday afternoon, every waitstaff person that we saw walked passed that table without doing anything to clear it. On our second visit, there were multiple waitstaff members that walked by our table and did not clear the dirty dishes piled up. Our waitress was really great and seemed busier than those standing around. Nothing happened at our table unless our waitress did it herself...they don’t help each other? Positive notes: the grounds are beautiful with a great view of the water. The pools are gorgeous and relaxing. The Tiki hut has yummy drinks and really good live music. The shuttle service into downtown was fantastic- super nice and informative. The reception and valet were so friendly and helpful. Our room was spacious and comfortable. We will definitely stay here in the future. Beautiful hotel and would highly recommend it! I read others reviews before I booked and the only downfall was the restaurant, however, I ate there twice and the food was great. Wonderful atmosphere and fun people. Though I was traveling on business, this hotel ticks many boxes for families, with interesting and diverse sites nearby, fabulous swimming pools, and a bright, cheerful environment. Room is very spacious and clean. Great location for those who dont want to stay downtown. Pretty view. The only thing is housekeeping didnt give us clean bath rug after they cleaned our room and no extra toiletries were given also for room of 2 adults and 2 kids. Only 1 set of toiletries and none the next day. This is a gorgeous hotel! However, they did not service our room in five days! We even asked about the lack of service twice and the night manager assured us the room would be cleaned. Nope! It was very disappointing. My husband and I stayed at the Beach Club for a long weekend and it was the perfect getaway. On the water with a lovely pool and pool bar and a free shuttle into downtown Charleston, so we got to enjoy the best of both worlds; the water and downtown. The rooms were very large and beautiful decorated with water views and an extremely comfortable bed with a gorgeous bathroom. The only downside was housekeeping was a little slow, the plumbing fixtures were loose in the bathroom and towards the end of our weekend the room had a mildew-ish odor. BUT we will definitely stay again. This was my first time visiting Charleston, and I was extremely impressed by the staff, location, views, and room. From the moment we stepped inside the hotel, we were welcomed and assisted with all of our needs. The room was clean, the beds were very comfortable, and service was wonderful, as well. The staff went above and beyond, and on a rainy night, we were offered complementary umbrellas on our way out the door. This is the best hotel experience I've had, and I will be sure to return with other guests. USS Yorktown is within a 5-minute walk of The Beach Club at Charleston Harbor Resort and Marina while other popular sites like Patriots Point are within a 15-minute stroll. This 4.5-star hotel has 92 guestrooms and offers conveniences like 2 restaurants, a full-service spa, and an outdoor pool. Enjoy dining at the hotel's 2 onsite restaurants: The Fish House specializes in seafood and serves breakfast, lunch, and dinner; Tiki Bar- Seasonal offers relaxing pool views. Savor a meal from the comfort of your room with 24-hour room service. For your convenience, a full breakfast is served each morning for a fee. A flat-screen TV comes with cable channels and pay movies, and guests can stay connected with free WiFi. Beds sport premium bedding and the bathroom offers a hair dryer and designer toiletries. Other standard amenities include a fireplace, a balcony or patio, and a minibar. 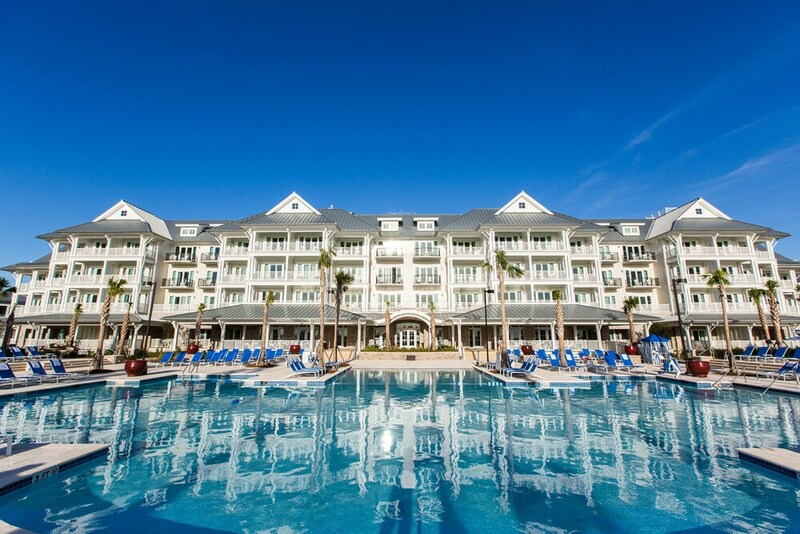 Built in 2016, the brand new The Beach Club at Charleston Harbor Resort and Marina features a full-service spa, an outdoor pool, and a children's pool. Transportation is made easy with a free area shuttle. The front desk is staffed 24/7 to help with tours or tickets, securing valuables, and luggage storage. Other amenities at this luxury hotel include a 24-hour fitness center, free WiFi in public areas, and a 24-hour business center. The Fish House - Restaurant and bar specializing in seafood and serving breakfast, lunch, and dinner. Alfresco dining available (weather permitting). Kid's menu available. Tiki Bar- Seasonal - Poolside Cafe specializing in American cuisine. Alfresco dining available (weather permitting). The nearest major airport is Charleston, SC (CHS-Charleston Intl. ): 22-min drive, 15 mi/24.2 km.